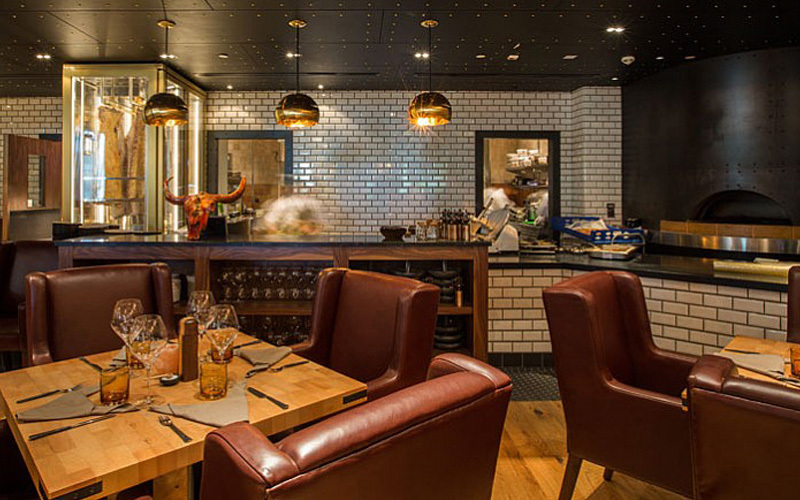 Inspired by modern meateries from across the United States, The Hide is a carnivore’s dream. Inside the décor is warm and welcoming, as are the front of house staff who make you feel instantly relaxed and at ease with perfected hospitality. Red meat is the star of the show at this casual yet high-end restaurant, and the menu doesn’t disappoint..
To start, we shared dishes of beautifully roasted scallops and squid, plus a warm, oozing four cheese artichoke dip (incredibly moreish! ), and my favourite of the three, a DIY rose veal steak tartare – served with a gorgeous Bloody Mary tonic and sourdough toasts for scooping. For main, the prime back angus tenderloin came just how I like it, medium-rare and packed full of flavour. My dining partner enjoyed the flat iron steak with Korean marinade and kimchi salad, which was as equally tasty. On the side, don’t miss the creamed kale and buttermilk onion rings. And, if you have room for dessert, the campfire s’mores come layered in a Kilner jar, melted to marshmallow, chocolatey perfection. This is fantastic spot for a social evening out with great quality food. For the guy’s I’d recommend heading in on a Tuesday evening where all men receive two for one on American prime time cuts, Jack, mixed beverages and selected hops/grapes – plus during November, the best groomed gentlemen on the night wins a voucher for Chaps and Co. (all in the name of Movember).